Competition barbecue is big business. With “reality” TV producing superstars like Myron Mixon who has a barbecue sauce line and his own brand of smoker there seems to be no end in site for the popularity of barbecue of all variations. 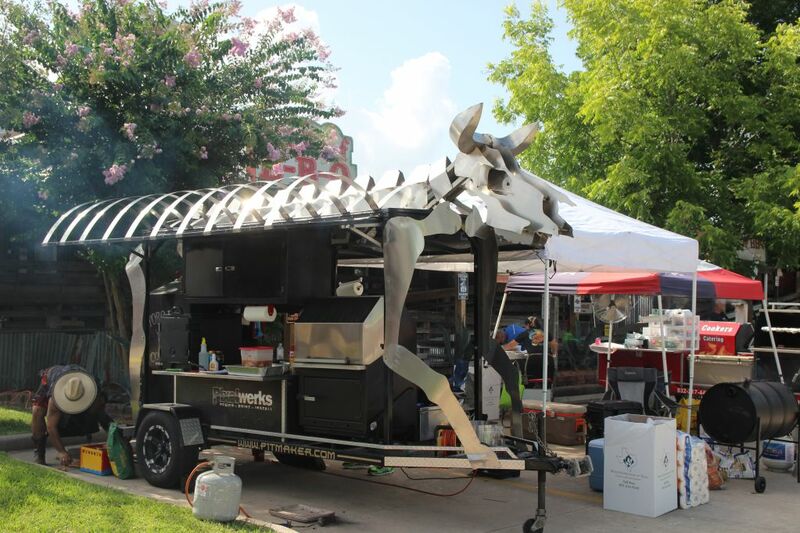 However, the food cooked in competition is probably not something you would want to eat an entire meal of, especially if you like central Texas style barbecue. 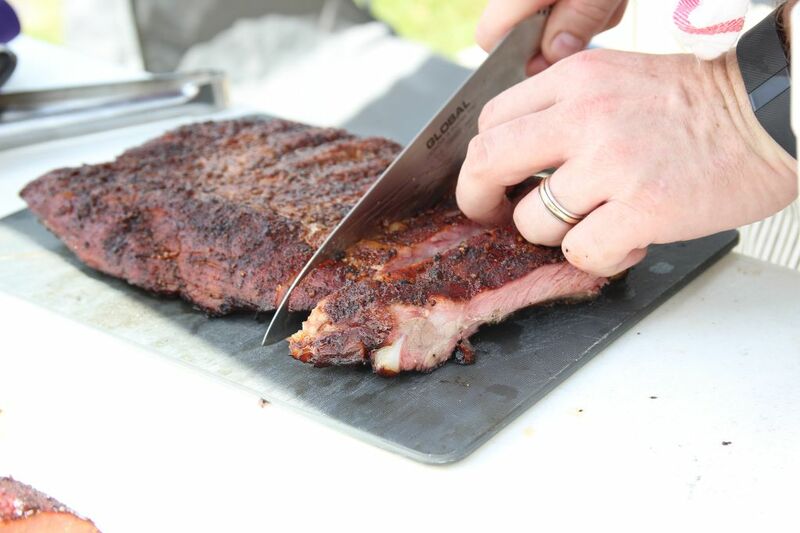 Since the judges take only a single bite of meat, competitors crank up the seasonings and tailor the flavor to a sweet and buttery profile. Basting in Parkay margarine and injecting with chicken stock and butter flakes is par for the course. Meats other than brisket are also heavily sauced, often sweetly, and the meat is trimmed and shaped into uniform cuts that have visual appeal but have turned the product into almost a frankenstein version of what most would consider appetizing. Go take a quick look at what competition ribs and competition chicken looks like. 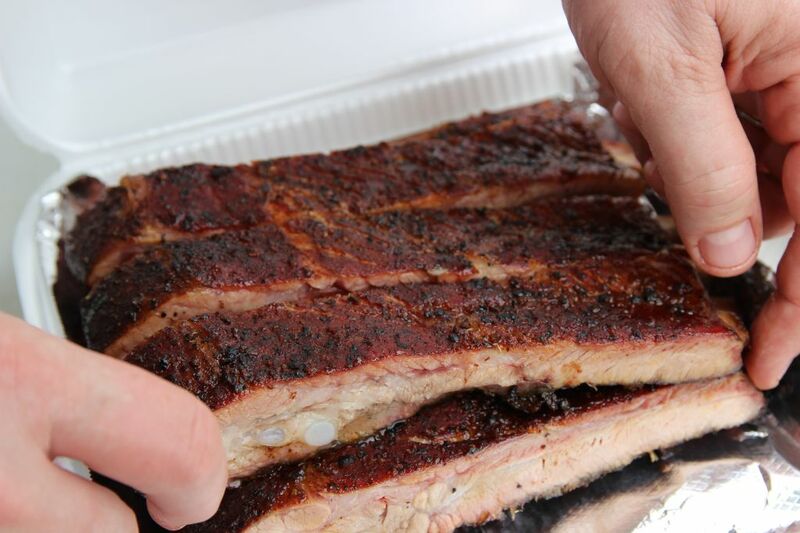 Imagine judging 50 different ribs, you would be more inclined to rate the one that “stands out” in flavor higher than others, but you also probably wouldn’t want a lot of heat since it could taint the taste buds for the next box you are judging. Since the food is judged by one single bite, this means is that complex and dense rubs, flavor injections, and lot of sauce are standard. Scott, Andrew, and I have talked about why we didn’t particularly like the concept of competition style meats but our lack of experience and curiosity spurred us to enter an actual competition. Andrew had the most experience of us, and has cooked in competitions before, winning in the brisket and placing high in ribs category. Scott has helped out at one event and spectated others. My entire experience has been watching a few episodes of BBQ Crawl with Danielle Dimovski. I haven’t even been to the Houston Livestock Show and Rodeo cookoff even though I’ve lived in Houston for over 20 years. We picked a small and unsanctioned event for our first foray, Tin Roof Barbecue’s inaugural charity cook off benefiting Banded Brigade. The cook off would be limited to a small number of teams (less than thirty) and offer a grand prize that was eventually raised to $500. There also wasn’t a brisket category. This was a good thing as it meant we wouldn’t need to be up all night cooking and could show up in morning of the event. There were three categories: open steak, chicken, and ribs. This sounded simple enough. We had no realistic expectations of winning but I won’t lie, we did dream of it, just like one dreams of winning the lottery after purchasing a ticket. Ironically, about a week after our competition, I saw the BBQ With Franklin episode of him and his dad entering a very competitive KCBS event with 53 teams. I wished I had watched it prior to our event as it has very good basic information on competition style barbecue. You can watch the video (and others) by clicking here. The information from John Markus in the video was spot-on. Less than a minute into the video Franklin explains that competition barbecue is NOTHING like what they cook in the restaurant, and it’s true. When the judging was complete he finished overall 31 out of the 53 teams, with a highest place of 17th for brisket and a lowest of 42nd for chicken. Full results here. Now, I am sure those 16 teams who placed in front of him for brisket will walk around boasting for the rest of their life, and congratulations to them, but this wasn’t a comparison of Franklin’s normal product and it doesn’t mean you or I would necessarily eat their brisket over his. It is also a single bite by each judge on a single day of cooking. I think he did very well in a competitive field for a type of barbecue that he isn’t accustomed to preparing. His competition team name was Double Nickles on the Deckle, which appears to be a reference to punk band Minutemen and their album Double Nickles on the Dime. If indeed this is the reference then I give even more props to Franklin, because old school punk was a favorite of mine. As the event date for our competition neared, Andrew started putting together a list of supplies and Scott added to it. The list grew and I began to realize this was going to be more serious than smoking a little meat in the backyard. Since we wouldn’t be able to walk into our house to get whatever supplies we would forget, we had to ensure most of what we needed would be packed and ready. 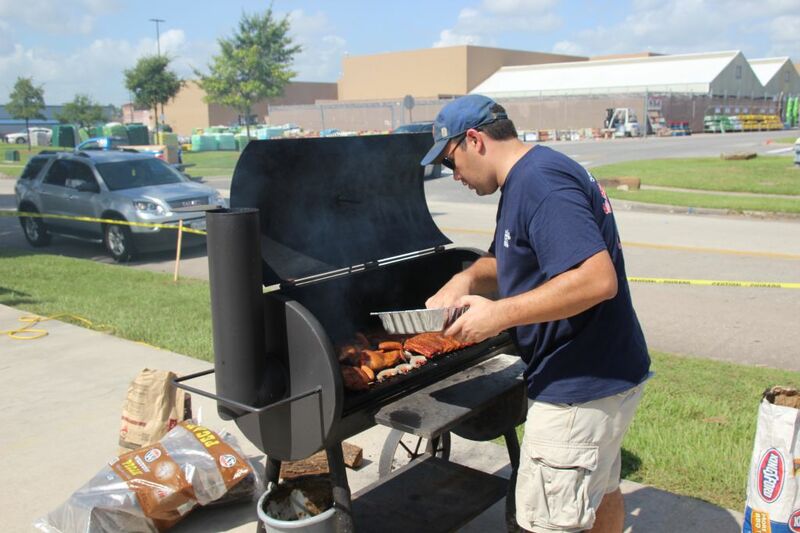 Our biggest logistical hurdle was getting Andrew’s smoker to the cook off. Many competition teams have pits mounted on trailers or load up trailers with their supplies. Some teams have custom trailers with team logos and much more. We would load up Andrew’s pit into the back of Scott’s truck for the short drive over to Tin Roof. 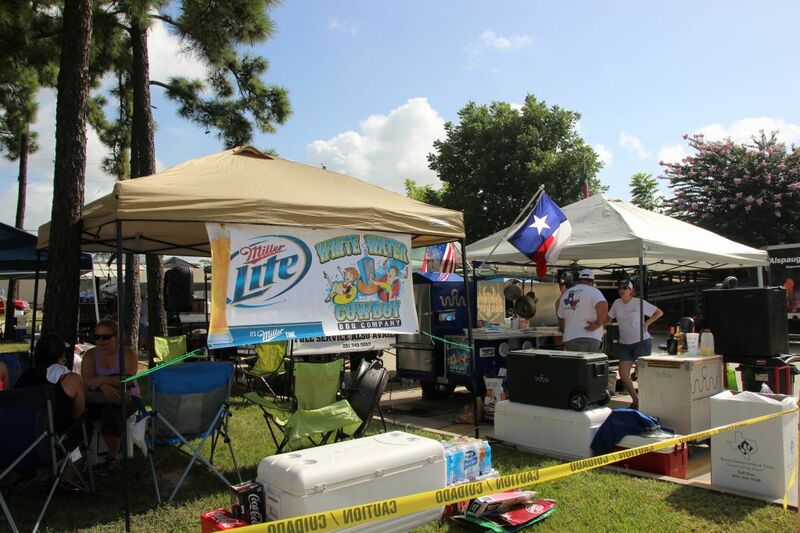 The event was not sanctioned but would follow rules similar to Texas Gulf Coast BBQ Cooker’s Association. Garnish and additional contents were allowed for the steak, but chicken and ribs were to be the only item in the turn in box. This made it a little easier for us although visual appearance was still a factor in judging. Andrew has competition experience with his ribs so that would be his baby. Chicken was simple enough we thought, and for steak we figured rather than try and get too creative we would just purchase a high quality ribeye. I was informed that we should cook two of each item and pick the best one. 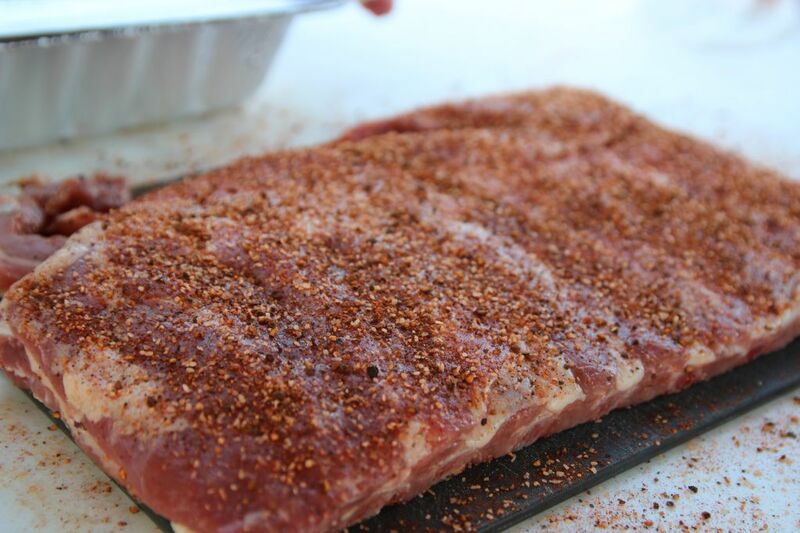 With ribs, the standard is to slice more than one rack individually and then pick the best ones out of the combined racks. The night before the competition I had some difficulty sleeping. When the alarm broke through my slumber I considered going back to sleep before eventually dragging myself into the shower. After an hour’s drive to Andrew’s house I was awake and getting excited. The caffeinated beverage I had probably helped that along, though. When we made it to the cook off I became nervous. What I had assumed would be a bunch of backyard cooks or a low key tailgate party looked more like what I’ve seen on TV, with teams that had matching shirts and large custom trailers with team names and logos. 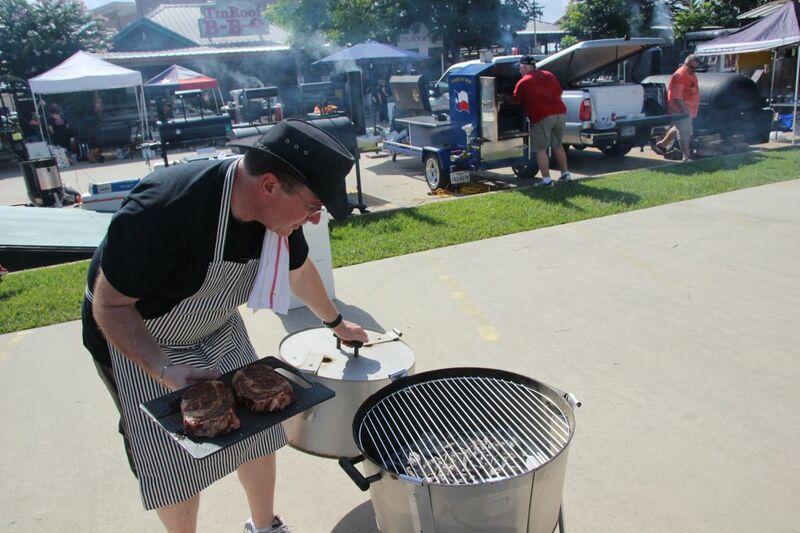 We didn’t have the smallest setup though, we were second to someone who was working with only two Weber kettles. By the time we got our coals burning the parking lot had filled up with some impressive equipment. There were people with enclosed trailers who rolled their pits out, lots of custom trailers including ones that include sinks, and a couple of Pitmaker Vaults. The one I found most impressive was the Toro Locos themed trailer. Andrew’s $300 pit paled in comparison to rigs that were in the $20,000 range but we knew it could still crank out worthy meats. My teammates had planned out when we would need to put our meats on; Steak at or a little after 10 for a slow smoke followed by a reverse sear to make an 11am turn in, Chicken and ribs at 9 am for 12:30 and 2pm turn ins respectively. We got the steaks on the grill with salt and a little pepper. They were going a little slower than we had planned so Scott added some charcoal which eventually got them to temp a little before our time goal. This meant that the sear time was shortened, but overall things were still looking good. 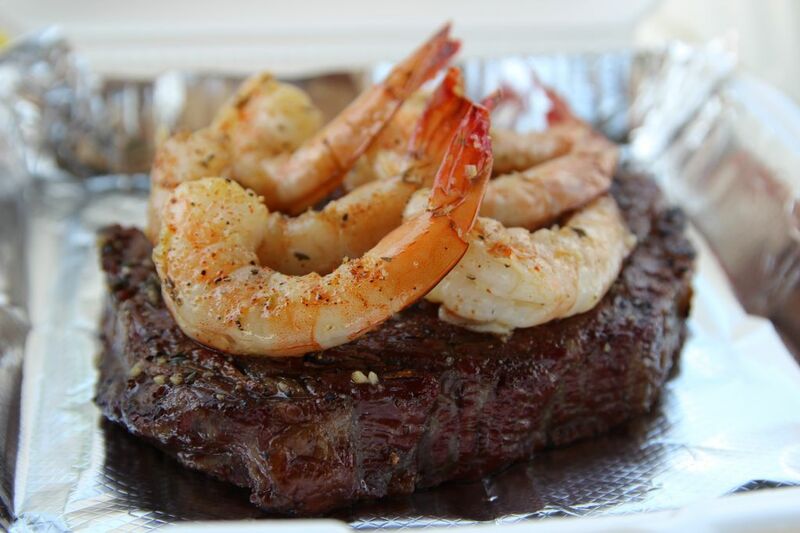 Andrew smoked the shrimp and we rubbed some of the compound butter he had prepared into the steak. The compound butter added a nice flavor and was made of garlic, thyme, lime zest, and a little lime juice. There was an allowance of ten minutes before and after the turn in time which provided a 20 minute window. Since we didn’t want our steak to get cold we turned it in at the early part of the window. We then divied up the extra steak for an amazingly good breakfast bite. We procured the steaks from 44 farms and I can honestly say it was in the top 5 that I’ve ever had. However, it was “just” a steak with shrimp and seasoning. We didn’t know what other people would be turning in for the open based category. Focusing next on the chicken which we had brined with Oakridge Game Changer, we chose Meat Church’s Deez Nutz Honey Pecan rub for the seasoning which was applied above and below the skin before setting the skin into place with toothpicks. 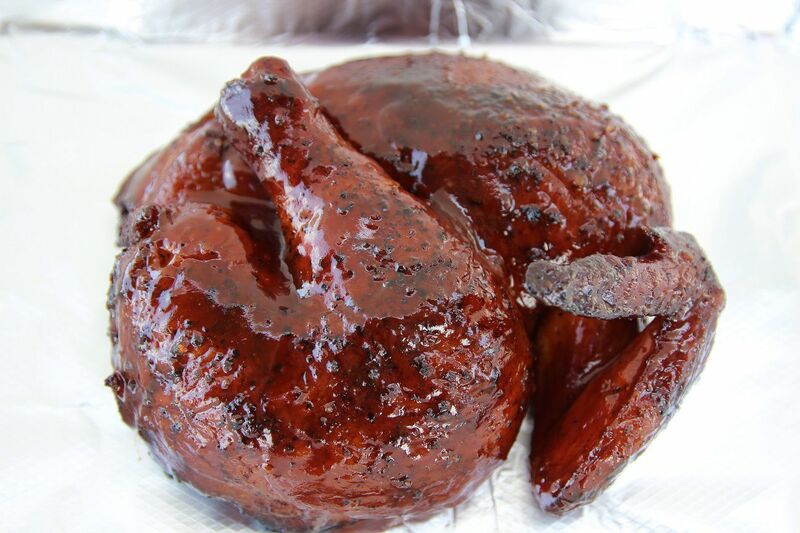 When it came time for the sauce glaze Andrew and I hedged and complained but Scott’s application of Head Country sauce made them look right for competition and we felt like the combination of brine, season, and sauce worked well together. We had it on excellent authority to use Blues Hog sauce but we couldn’t obtain it in time. We turned in our best half, and took our first bite of competition chicken. It was good, and I will probably cook it again. We didn’t go to the extremes mentioned earlier with chicken thighs such as shaving the fat off the skin, but we felt like we had a solid entry. J.C. Reid of the Houston Chronicle came by and we had him sample some of it as well. The sun was blistering and sweat was rolling but we were on to our last entry. Andrew had spritzed the ribs and wrapped them in foil for the last part of the cook. This is a little nerve wracking because you can’t see the product until it’s time to unwrap. A few temperature checks later we unwrapped them and gazed at another very nice looking product. Simply seasoned with Andrew’s salt, pepper, paprika, and garlic powder rub they had a nice shade of burgundy. A few dashes with Andrew’s homemade sauce made for the final touch before Scott sliced both racks and lined the individual ribs up for selection. This event required seven ribs and we carefully placed the best seven into order; four on the bottom and three on the top. We made our final turn in and waited. Our spirits were high and we were proud of what we had turned in. At the award presentation we waiting anxiously for a “call”. Simply enough, this is when they call your team name for a high score. In this event the top ten in each category and top ten overall were called. Steak was first and we didn’t get a call. Chicken was next, and again we didn’t get a call. All ten winners of ribs were called out, and our spirits sunk a bit. The winners of ribs scored what Ii believe was a 178 out of a possible 180, meaning nearly every judge’s scores were perfect across the board, an astounding rating. The overall winner was Cool Hands Cookers. We packed up our gear and began to reconsider our performance. We placed around mid pack overall and the best I could tell we finished 12 out of 29 teams in chicken for our highest placing. That means we beat about half of the field, and after a little research I found that many of those also compete in the Texas Gulf Coast BBQ Cooker’s Association. Some of those teams compete often placing well and winning grand champion at other events. This wasn’t a backyard cook out, even if it was unsanctioned, and we did well. three 14/15 for taste, one perfect tenderness and three 9/10, our lowest average score for appearance. We had arranged shrimp on top of steak and I think someone may have bumped our box while waiting for judging, knocking the shrimp into disarray. The butter may also have pooled onto the bottom of the container.